Spice up your next fiesta with these reusable shot glasses hand-carved from Himalaya salt. They're pretty in pink, but don't be fooled: These shooters can hold their tequila. 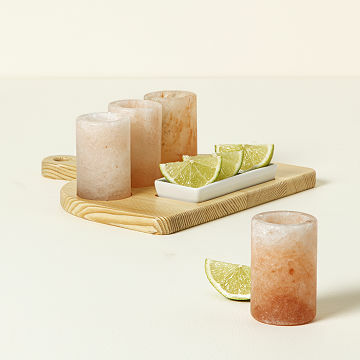 Crafted from Himalayan salt, the festive glasses give your shot of tequila or mezcal a delicious, salty finish. Bonus: Salt is naturally antibacterial and super stable, which means they're up for multiple rounds (and fiestas). Give the set of four to your favorite party host or friend who always brings the fun. Handcarved in Pakistan. Care: Not dishwasher safe. If standing liquids are left in Salt Tequila Glasses, they will slowly erode over time. Wipe clean when not in use and store in a dry place. Salt is naturally anti-bacterial. These glasses are carved from the finest food grade Himalayan salt and each glass includes a PET plastic insert to prevent leakage. Click here for detailed directions. These shot glasses are really cool and unique. We haven't used them a ton yet but they seem to rinse out easily and hold up well. I love these shot glasses! Best gift for the drinkers that have everything! I was told that these glasses really added great flavor with the salt ! I love finding unique gifts that really speak to a persons lifestyle and likes. This was such fun present. Enjoyed by all. I got the gift for my roommate for her birthday. Becuase it was her birthday, I told her that I would take a shot with her. I'm not an avid tequila drinker like her so, it was a long shot that I would actually enjoy taking it. I can honestly say that taking the tequila shot out of these shot glasses, I ACTUALLY wanted another shot... It's a party, right? They are PERFECT. Truly amazing product. Turned me into a some-what tequila drinker. These shooters are the perfect gift for a natural entertainer! I will be purchasing more of these! Worked great for tequila shooters. Gives off the perfect amount of salty taste with no messy shaker. Also look pretty cool!